Status: Deceased; Active 1965-1968. Born: 1930-07-24. Died: 1998-06-27. Birth Place: Khotimsk, Mogilev. Graduated from Military Engineering Academy, Leningrad, 1960 Soviet Air Force. Test-engineer at Kapustin Yar and then at Baikonur. Cosmonaut training November 1965 - December 1967. 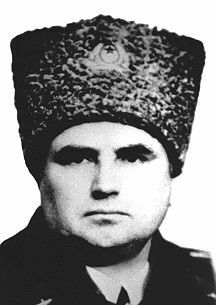 Left cosmonaut cadre on 5 January 1968, supposedly for weight problems (85 kilograms). Retired from Air Force as a Colonel in 1981 und taught then Physics in the School at Monino. Died in Zvyozdny Gorodok, Russian Federation. Family: Cosmonaut. Country: Belarus. Flights: Soyuz VI Flight 1. Agency: VVS. Bibliography: 4452, 5157. 1930 July 24 - . Birth of Boris Nikolayevich Belousov - . Nation: Belarus. Related Persons: Belousov. Belarusian engineer cosmonaut, 1965-1968..
1966 November 25 - . Soyuz launch commission - . Nation: Russia. Related Persons: Belousov, Gagarin, Gorbatko, Kolodin, Mishin, Nikolayev. Program: Soyuz. Flight: Soyuz 1, Soyuz 2A. Spacecraft: Soyuz 7K-OK, Yastreb. 1966 December 31 - . Launch Vehicle: N1. 18 cosmonauts in lunar training - . Nation: Russia. Related Persons: Artyukhin, Belousov, Bykovsky, Dobrovolsky, Gagarin, Gorbatko, Gubarev, Gulyayev, Khrunov, Kolesnikov, Kolodin, Komarov, Nikolayev, Popovich, Volynov, Voronov, Zholobov. Program: Lunar L1. Class: Manned. Type: Manned spacecraft. Spacecraft Bus: Soyuz. Spacecraft: Soyuz 7K-LOK. Gagarin, Komarov, Nikolayev, Bykovsky, Khrunov, Gorbatko, Voronov, Kolodin, Popovich, Gubarev, Artyukhin, Gylyayev, Belousov, Kolesnikov, Volynov, Doborvolsky, Zhobolov..
1967 December 25 - . 1965 Air Force Group cosmonaut trainees are examined. - . Nation: Russia. Related Persons: Belousov, Grishchenko, Sharafutdinov, Skvortsov, Voloshin. Of the 18, 13 scored a '5', four scored '4', and one '3'. Belousov, Grishchenko, Skvortsov, Sharafutdinov, and Voloshin - the low scorers - are all to be dismissed from the cosmonaut corps..
Soyuz VI Flight 1 (cancelled) - . Crew: Kolesnikov, Popovich. Backup Crew: Belousov, Gubarev. Nation: Russia. Program: Almaz. Flight: Soyuz VI Flight 1. Spacecraft Bus: Soyuz. Spacecraft: Soyuz VI. The planned first flight of the Soyuz VI combat spacecraft was planned for early 1969, beating America's equivalent Manned Orbiting Lab. The project was cancelled in 1968..
1998 June 27 - . Cosmonaut Boris Nikolayevich Belousov dies at age of 67 -- Natural causes. - . Nation: Russia. Related Persons: Belousov. Belarusian engineer cosmonaut, 1965-1968..